You know that I am a live music aficionado. My last several posts have really highlighted that part of my SL life. But I like the visual arts too. I have always loved Callipygian Christensen’s photography. I’ve learned so much by discussing Calli’s art with her, talking about technique and vision and structure. So if Calli tells me that she has found a great new photographer that I will like, I know I am in for a treat. I have been remarkably inept lately at telling you about things BEFORE they happen (remind me to tell you about the fashion show NEXT weekend). Today, however, I am actually on schedule and can post the notice about the OPENING!!! From his first postcard posted to Snapzilla 6 months ago, Prandi has provided a unique view of Second Life through the eyes of an old wandering sailor. Saturated monotones and exceptional use of light give his images the feel of a different time and place. Each one gives just a glimpse of a moment that leaves us wanting to know more of that story. With over 900 images now shown on Snapzilla, Prandi has selected his favorites to be shown inworld for the first time. I tried to wangle a sneak preview but it has not yet happened. So come join me at the preview this Sunday, Nov 1st at 11am SLT and we will enjoy it together! The Fashion Research Institute invites you to the opening reception of this exhibit on Sunday, Nov. 1st, 2009 from 11:00am SLT to 12:30pm SLT. 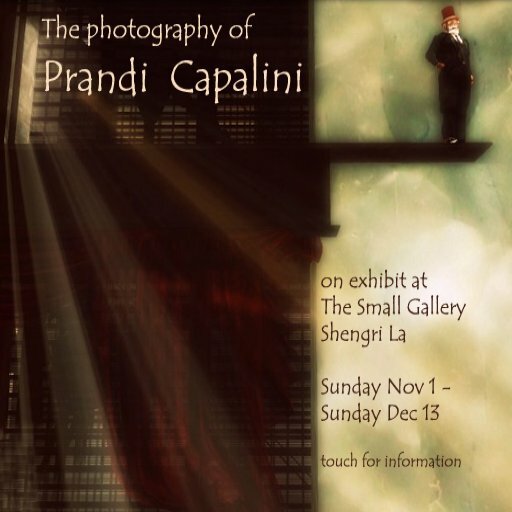 Drop by, meet the artist and enjoy his work in the tranquil tropical setting of Shengri La. If you cannot attend the opening, please drop by the gallery anytime and enjoy the exhibit. Let me confess right up front – I am lifting the details about the exhibit from my friend Andrew Sempere (Tezcatlipoca Bisiani). Andrew is an artist in his own right, with many RL exhibits around the country. But as usual with the friends I mention here – Andrew is much more than that. He is intelligent, funny, kind and generous. He has a passion for the arts and for making art available to the rest of us, who may not be as connected or as informed. 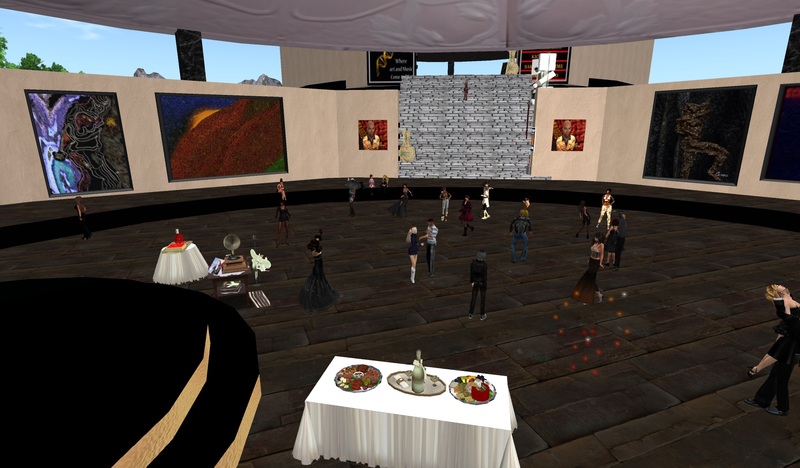 He serves as curator for many institutions, including the IBM EXHIBITION SPACE (IBM 3, Secondlife). The IBM space (for which Andrew deserves a great deal of credit for both the concept and the actuality) opened last month with a stunning exhibit by Glyph Graves – truly phenomenal. I mentioned it here and I do hope you saw it. 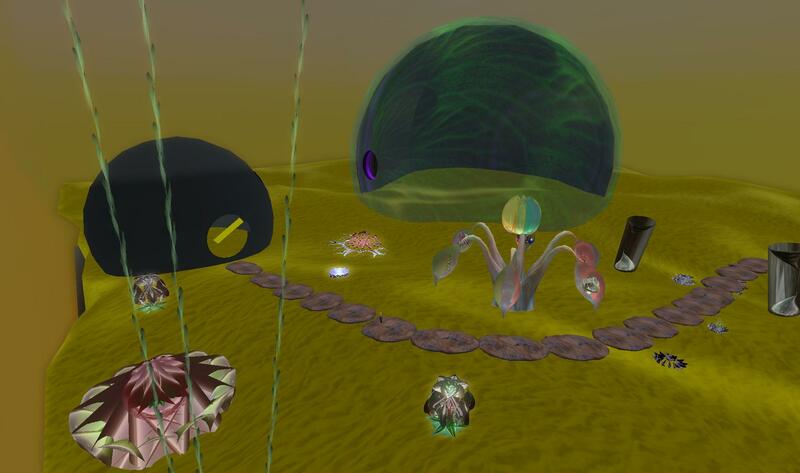 Friday, July 10, 2009, the second exhibit opens at IBM 3 (slurl IBM 3 (55, 50, 23)), Bryn Oh’s The Rabbicorn. “The Rabbicorn tells the melancholy origin story of the title character, an original robotic being in the Bryn Oh universe. The Rabbicorn exists in a world of poetic narrative, subtle ambient sound and beautiful visual artistry, part Gorey, part Poe, part Velveteen Rabbit, but with an original take that is uniquely contemporary, and uniquely Bryn.” Andrew’s post has more details about Bryn’s style and technique. I urge you to click through and read it. I am including the publicity photos, courtesy of Bryn Oh and Andrew. Thank you both very much for providing/sharing the photos. I was totally blown away by the first exhibit. Jaymin and I had a wonderful time exploring that together. I cannot wait for tomorrow night to see Bryn Oh’s work and lose myself in the art and the story. Ping me and let’s explore this exhibit together. It’s more fun with friends. *grin* Always. Calli has opened a new art exhibit. I was fortunate enough to “sneak in” for a preview. Quite honestly – these may be some of the best photos I’ve seen from Calli. They are simply great. Each time I thought I’d found my “favorite”, I moved on to the next and thought “Oh wow, I HAVE to have this one, this is my favorite.” It’s a great, great show. 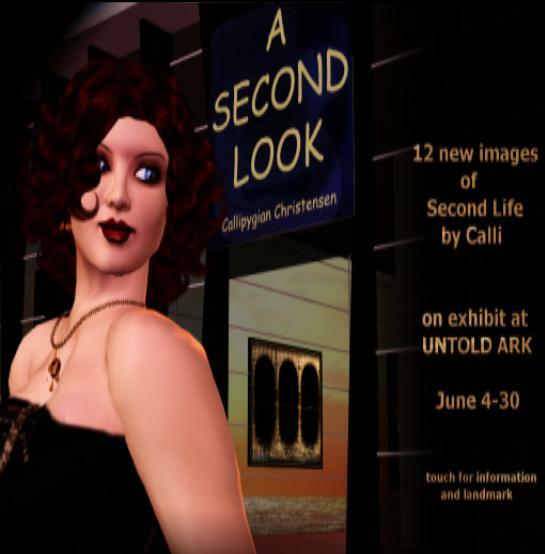 Callipygian Christensen invites you to enjoy ‘A Second Look’, 12 brand new images of Second Life now on display as a guest exhibit at the Untold Ark. A second look can mean many things; as I go through the images I take I often set a number aside as not usable, but as I look through the ones I am about to delete some part of the image jumps out and demands a second look; sometimes as I look at various locations I don’t ‘see’ an image but later, whether minutes or days, I might be there again with a different time of day or different windlight setting and on second look, an image is there; I guess every image taken here is actually a ‘Second look’ as well :), and the 12 images in this exhibit, two of them totally unretouched snapshots, are images I feel deserve a second look through your eyes as well as mine. I have no words. I HAVE 90 pictures. This exhibit is phenomenal. Fantastic. Fun. A love story. A sad story. Maybe a hopeful story. Unbelievable. I do NOT want to hear that you have no time, blah blah. GO! AS usual, Bettina Tizzy writing for “Not Possible in RL” has the best description/explanation of the exhibit. And excellent pictures as well. Read her post. I feel like a total newbie again. I am overcome with awe, wonder and joy. I am transported by the creativity and imagination. I have difficulty navigating 3D space. I cannot comprehend how Glyph can not only imagine this but create it. Incredible. Wonderful. Glyph, Tez – thank you so very very much. I was lucky enough to explore with my good friend Jaymin. It’s much more fun with someone else. He saw so much that I didn’t see. And when I got stuck or fell through things – he was there to tp me back to where I should be. *grin* Thanks Jay!!! I have uploaded my photos to Flickr. I’m sorry – there are way too many pics of me in there – but I was trying to get some sense of proportion/perspective. I also thought that I would edit myself out of most. I had no idea I was going to end up with 90 pictures. So just ignore me….. This is one of those weeks where I am a bit busy and don’t have much time to be creative on my own. 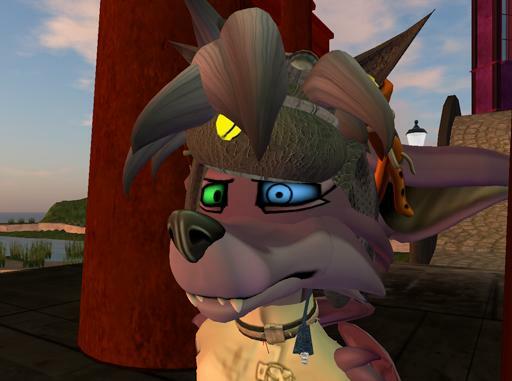 So today I am lifting a post from my friend Andrew, who has introduced to me to soooooo much art in SL. He is an art curator as well as an artist in his own right. Andrew’s blog also has one of the best blog names that I’ve encountered: A repository of ten thousand indignities and the harbinger of God knew what. LOL. It is certainly evocative, no?? Andrew’s avatar, Tezcatlipoca Bisiani, my favorite purple avatar, is curator for the new two-sim IBM Exhibition Space, located on IBM2 and IBM3 in Second Life. The inaugural exhibition for the IBM Exhibition Space is Strangers Also Dance by Glyph Graves. Glyph is a Australian based artist whose interactive works incorporate sound, elaborate visuals and narrative. I could lift all of Andrew’s blog, but you can click here and read it all for yourself. Even better – meet me there Saturday, May 23, 2009, 6pm SLT and we can all be part of a new, exciting SL experience. And as long as I am stealing from all my friends – *grin* – don’t forget that you should be checking out Chestnut’s weekly recommendations as well – she ALWAYS knows what’s happening and where to go.